Air Tahiti Nui is a the flag carrier of French Polynesia that was founded in 1996. Air Tahiti Nui fleet consists of 5 Airbus A340 300 aircraft. Code share airlines for Air Tahiti Nui are: Air France, Aircalin, American Airlines, Qantas Airways, Air New Zealand, Japan Airlines, Korean Air. 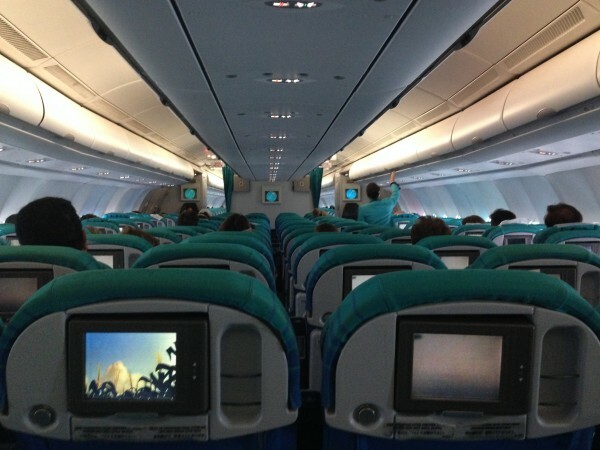 Air Tahiti Nui serves 4 countries around the world on routes with flights to French Polynesia. flew both ways LAX-PPT-LAX 10/12/16 and 11/8/16. Cons: worst seat of my life outbound end of row next to bathroom and yakking attendants, no recline. My fault for picking it, never slept. Both ways flight crew responded to requests but no extra level of service in economy. Two meals served with beverages, NO SERVICE FOR WATER on a 7.5 hr long haul like I have experienced with Delta, United flying to Europe. Recipe for dehydration. Seats ok but could not lean forward and rest my head on the tray table, no room. Headrests on seats are adjustable but WAY over my head at lowest spot resulting in bent neck. Designed for 6' men obviously as I am a tallish woman at 5'7". No foot rests, had to rest my feet on the carryon. light is controlled by the touch screen on seat back in front of you. I could not get it to work either flight. I checked cost of reverse flight PPT-LAX-PPT and it was 30% less in French Polynesian Francs than USD. Why? Pros: On overnight flight they bring up cabin lights slowly at end of flight for more natural wakeup. Not like Japan Airlines that just flipped on the brights WAY to early last year when I flew Narita to Honolulu. Lots of interesting short videos on Polynesia. Clean cabin and the airline provides a comfort kit in economy (soxs, mask, earplugs). BIGGEST PRO: If you travel with sports gear (surfboards, dive equipment, outrigger paddles, fishing gear) they accommodate and do not charge extra! I brought a 22kg bag, an additional inflatable 11' SUP in bag, 2 SUP paddles and there was no baggage fee! Thank you Tahiti Nui!